L-R: Michael Hardy (KBR); CAPT Tony Mullan (Director Navy Training); CAPT Tim Standen (Director Training Authority – Engineering); Bill Docalovich (Naval Shipbuilding College, Program Director); Rob Hawketts (Chairman of the Board, NSI); Paul Whetstone (Naval Shipbuilding College, Training Quality and Assurance Manager). The Naval Shipbuilding College will work in close partnership with the Royal Australian Navy to identify secondment and outplacement opportunities for Navy personnel within the naval shipbuilding industry. 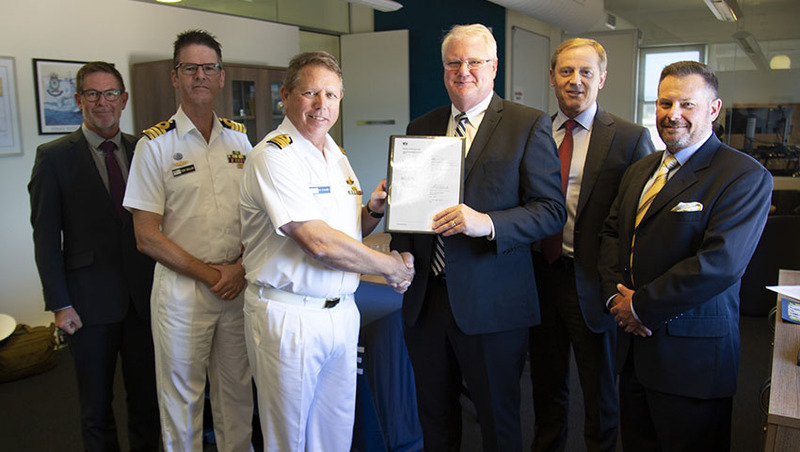 The Naval Shipbuilding Institute, which operates the College, signed a memorandum of understanding (MOU) with Navy, represented by the Director Training Authority-Engineering, Captain Tim Standen, CSC, in March. The MOU will guide how the Navy and the College will work towards mutually beneficial outcomes for the shipbuilding industry, Navy and the nation as a whole, setting the framework for the sharing of information and identification of engineering, technical, logistics and supply chain training opportunities for Navy personnel. The college’s Paul Whetstone said the agreement formalises the partnership, which has a focus of sharing knowledge and ideas on harmonisation of competencies between Navy personnel and the naval shipbuilding industry. "This will provide excellent up-skilling opportunities for enlisted personnel assisting the transfer of knowledge into the wider Navy, bringing a deeper understanding of the next generation of naval capability," Whetstone said. The initiative will identify industry outplacement and secondment opportunities for Navy engineers, technical sailors and maritime logistics sailors to sharpen and expand their skills and career. It will also help create a pathway for the Navy to gain further insight and experience in the sustainment and operation of a modern fleet of warships and submarines, spanning the entire capability life cycle. "We have seen this type of agreement work successfully previously with the Air Warfare Destroyer build program," Whetstone added. The college was established in April 2018 by the Australian government to identify and support the development of a skilled national workforce that will be required to deliver the $90 billion Naval Shipbuilding Enterprise. Based at the Osborne Naval Shipyards in South Australia, the college has a national focus on co-ordinating collaboration between industry, education and training sectors to develop endorsed programs that will deliver a skilled and capable shipbuilding workforce through existing higher education and vocational providers in Australia.